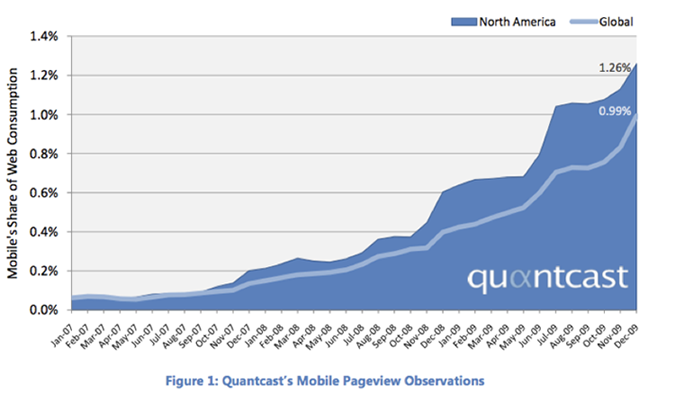 The mobile Web grew 110 percent in the U.S. last year and 148 percent worldwide as measured by growth in pageviews, according to a new Quantcast Mobile Trends report (embedded below). Even so, the mobile Web accounted for only 1.26 percent of Web consumption in the U.S. (and 0.99 percent worldwide). Apple’s iPhone and iPod Touch drove much of this growth. 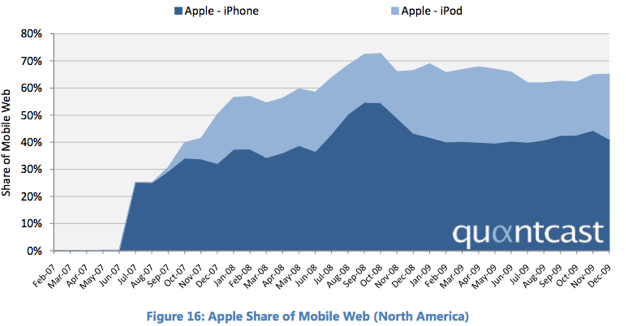 In the U.S., Apple has a commanding 65 percent market share of mobile Web access as of the end of December, 2009. Only 41 percent of that is from the iPhone. The other 24 percent comes from the iPod Touch, which has been growing rapidly as a mobile Web device even though it only has WiFi. Globally, Apple also dominates in every market except Africa (where simpler and cheaper Java phones still rule). Android isn’t really much of a player yet outside the U.S. But inside the U.S, Android is coming up fast, with 12 percent market share. Android is now the No. 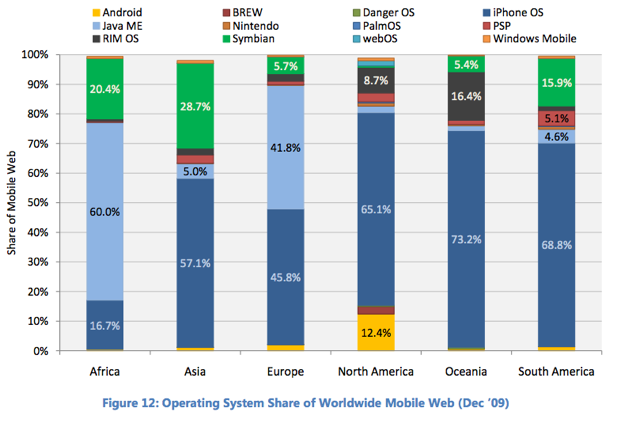 2 mobile Web operating system, recently beating out Blackberry’s RIM OS, which has an 8.7 percent market share. The sudden growth spurt of Android jives with Admob data showing that it doubled since October. And that’s before today’s release of the Nexus One. Most of that share comes from HTC handsets, and Verizon’s launch of the Droid in November. 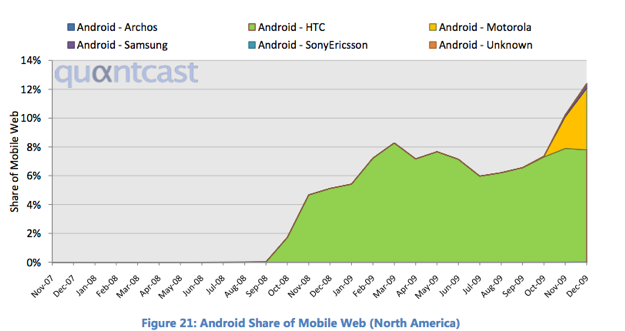 (Motorola’s Droid is the yellow part of the chart below.